Robert Woodhead Ltd is celebrating this week after winning a Silver award from the Considerate Constructors Scheme (CCS), for its work on a Derby housing scheme. Throughout this week, some of the top scoring site managers from across the country have been recognised for their commitment to keeping safe, tidy and considerate sites, as well as involving and engaging with the communities they work in. At the start of 2015 Woodhead completed work on a Derby Homes development on Victory Road in the Osmaston area of Derby. The five new homes were built following community consultation and a response to the local housing need. The land, where two former semi-detached properties had stood, received overwhelming support from the local community (88%) to be used for new housing. Site Manager, Paul Pygall, said: “This was a site that meant a lot to the local community and it was important we did the best job we could to minimise disruption to the nearby residents, but also work as closely as possible with the local community. Paul and his site team were visited twice during the nine month scheme, scoring a 42 and 43 out of 50 respectively on each occasion – both two of the highest scores Woodhead has achieved. Impressed after his visit to Victory Road, CCS Scheme Monitor Peter Bolwell said: “Care and thought seems to be given to everything at every stage. Extraordinary efforts have gone into community relations here, bearing in mind this contract value is less than £0.5m. Woodhead went to great lengths to go above and beyond the statutory requirements of a building site. Explaining the care taken to secure everyone’s safety – one of the Scheme’s five sections of the CCS Code, Paul said: “We met the neighbours before we started on site and conducted a traffic management analysis, including a cyclist survey. Eye-catching safety information was also displayed on the site hoarding thanks to the Derby Homes’ Junior Wardens – a group of young volunteers working with Derby City Council. Woodhead asked local community group OSCAR, what it could do to support some of their work while the team was on-site. They were asked to donate some fruit for a coach of children heading off on a day trip. But Site Manager, Paul, didn’t want to stop there. He decided to use the site hoarding panels to raise some cash for OSCAR, leaving a legacy behind them for the local community. The most unique environmental project the site engaged in was working with Derbyshire Wildlife Trust to install swift boxes into the new homes – ensuring nesting sites are available for the declining bird populations. It is hoped the scheme will now be replicated, wherever possible, to all new-build homes for Derby Homes. 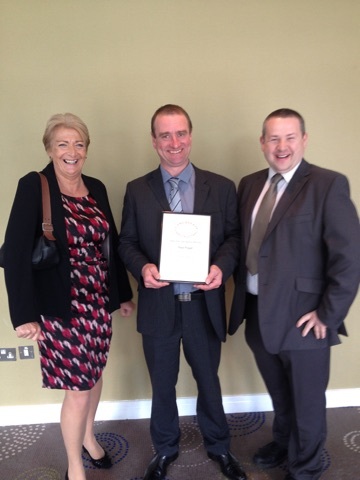 Following the successful CCS scores Paul Pygall was invited to attend the CCS 2015 National Site Awards in Manchester this week. The Victory Road development, which was commissioned by Derby Homes through procurement consortium, Efficiency East Midlands was among just 280 sites across the country that received the Silver accolades, sitting just a couple of points off the Gold standard. Anthony Slater of OSCAR, said: “We’re delighted for Paul and his team to have achieved such a high honour for the Victory Road development. We’ve visited the site a number of times throughout the process and spoken to local residents, who have all been very pleased with the way it’s been managed. Shaun Bennett, Director of Investment and Regeneration at Derby Homes, said: “There’s a huge amount of regeneration taking place in Osmaston at the minute and it’s important that we keep the community as involved and engaged as possible.